time Our Preschool runs according the Private School 3 Term Calendar. Open daily: 7:30am to 12/2pm Monday to Friday. 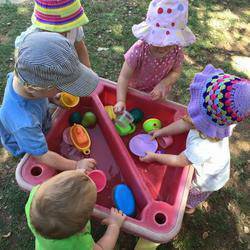 A Beautiful Little Preschool that provides love and learning to each and every child…. Since the most important lessons for children under the age of 5 years old are learnt on the playground and not in the classroom, we will be placing a large emphasis on structured and unstructured outdoor play. We have gained valuable insight at private school Grade R- Grade 3 level from the teachers themselves and as recommended we will be concentrating on gross motor, fine motor and sensory activities that will provide a great foundation for children as they enter a structured school environment later on. We will be running our school according to the Brainboosters philosophy which will enable us to maximize the time spent with children in the classroom to free up extra time for play outside. The program is designed in a way that creates a great foundation for learning with a focus on areas such as colour, shapes, numbers, food, animals and my body….. The teaching is very practical and interactive, thus allowing children to learn through play. We take children from 18 months until 4 turning 5 years old.